Frank Lloyd Wright (1876-1959) was one of the best American Architects. Fallingwater is his masterpiece, "the most famous residence ever build" ; tne AIA ( American Institute of arhitects ) refers to Fallingwater as "the best all-time work ofAmerican architecture". Designed and buil during 1934-1937 in Pnnsylvania, Fallingwater was a vacation house for the Kaufmann family: Edgar, Liliane and son Edgar Jr., owners of a department store in Pittsburgh. Fallingwater house and contents were entrusted to the Western Pensylvania Conservancy in 1963 and is, today, a house - museum and U.S. monument. 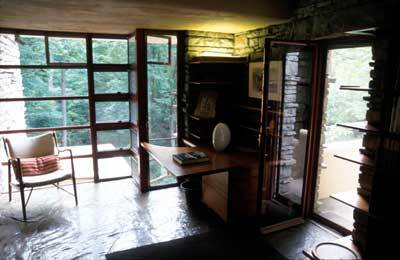 Fallingwater is a synthesis of "organic architecture"; it integrates man with nature, as Wright taught to his students at his Taliesen Studio. Fallingwater was constructed of sandstone quarried on the property and was built by local craftsmen. It follows the concept of integrating environmental factors, function, native materials, construction process and humans (the client). La Fundacion Frank Lloyd Wright fue establecida en 1940 para conservar y avanzar el legado de arquitectura organica, educacion organica y la conservacion del medio ambiente que F.L. Wright enseño en su escuela Taliesen. La guia PBS de F.L. Wright. Incluye proyectos, dibujos y textos. Tambien permite buscar sus construcciones por area en los USA. Pagina sobre Fallingwater por un aficionado. Seleccionada como uno de las 14 "casas museo favoritas" por lectores de la revista National Trust's Historic Preservation. 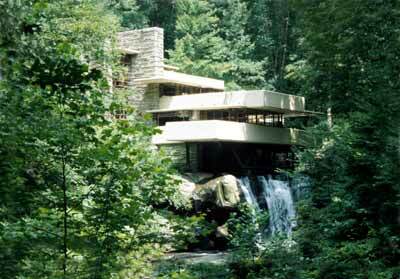 "...Fallingwater se ha convertido en el ejemplo perfecto de la casa museo" ( Frederick Gutheim, Inland Architect ). Building Guide; Prairie Houses; Louis Sullivan; links and more links.